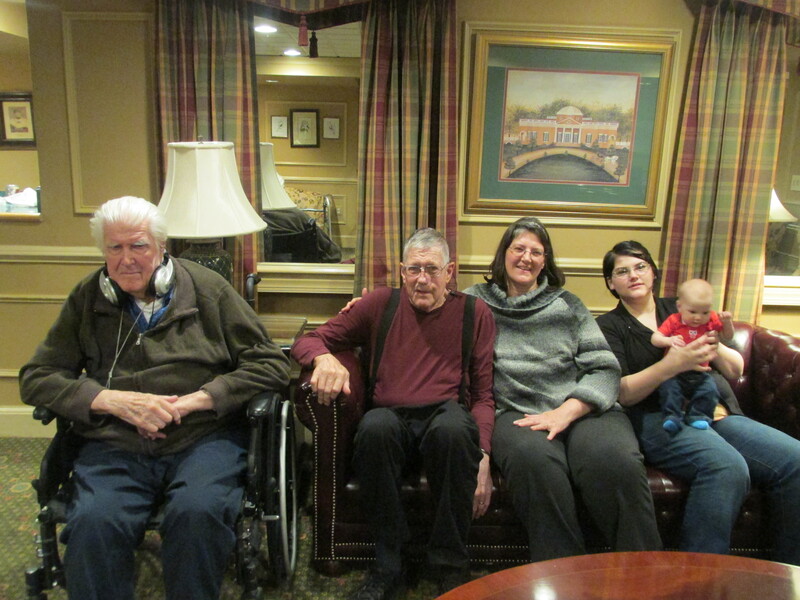 This past week my family got to do something not many families get to do: take a picture of five living generations. Dee, Sweetpea and I traveled with my parents to our nation’s capitol to see my only living grandparent, Grandpa, fondly known by his initials in almost all family communication as FJOB. 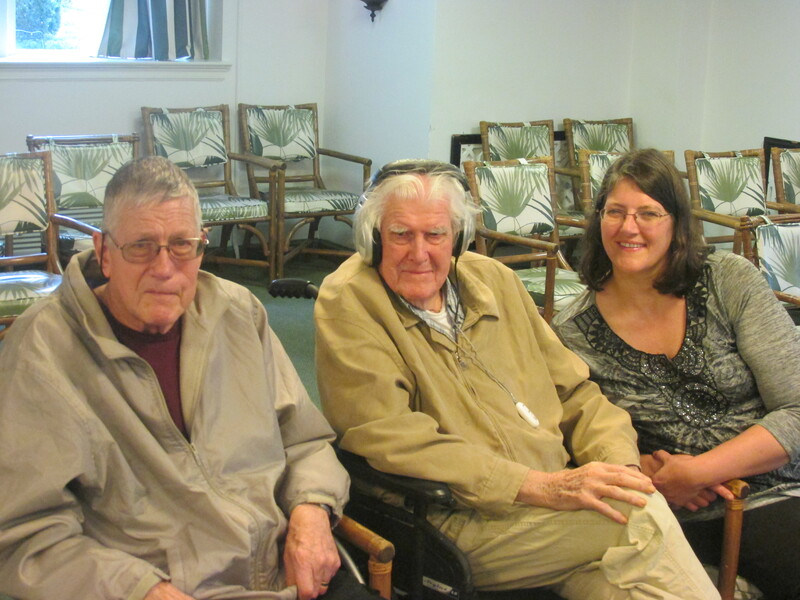 FJOB lives in a retirement assisted living facility in the part of the city known as Chevy Chase, which is actually very close to the city of Chevy Chase in Maryland. He recently moved from a sister facility in Georgetown, which is the oldest part of D.C. We stayed at the former facility which they are in the process of emptying in order to renovate…there were maybe ten residents left living in that huge building, which was good because we had a newborn with us who knows not how to be quiet when she is experiencing life issues like hunger, tiredness, and dirty diapers. We arrived in D.C. Thursday evening, and after checking into our accommodations, we traveled an eternity roughly four miles up Connecticut Avenue to Grandpa’s new facility. We arrived at a few minutes past eight only to find that his caregiver had already put him to bed and he was fast asleep. It seems 97 years of living have been exhausting. Grandpa goes to bed early and naps often, usually sitting up in his wheel chair. His mind is alert and sharp when he is awake, which is more than I can often say for my father, so Grandpa is ahead in that game. We headed back to our accommodations and after tucking Opa (my father) into bed for a nap in the suite Dee and I were sharing, my mother (Omie), Dee and I played a quick game of cards. We all decided after that that we were pretty tired, and Mom collected Dad and headed to bed. Our suite was on the end of the building, and I could hear traffic and people going by under my window (two stories above street level) all night. I am so not a city girl! I awoke Friday morning to the unwelcome sound of sleet hitting the window. 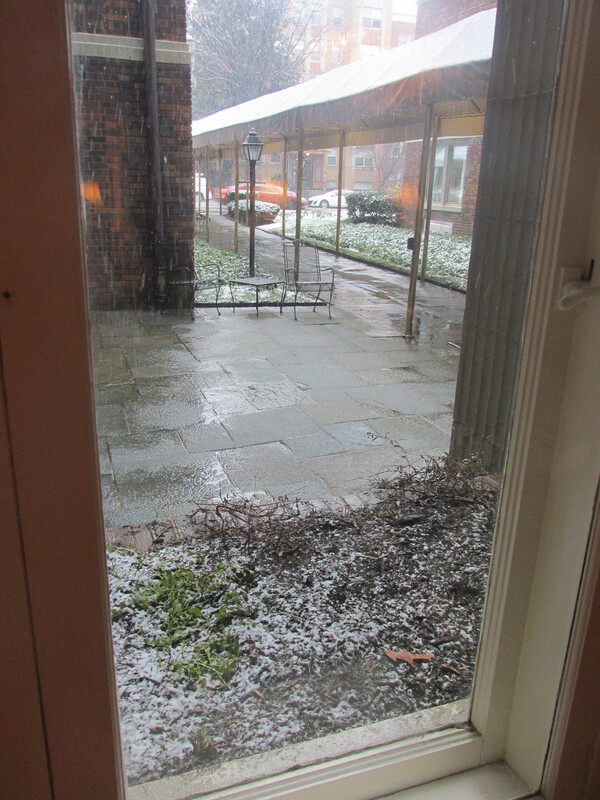 Snow on the ground outside the lobby in Grandpa’s new place. My mother has to do all the driving for her and my father now, so she welcomed the opportunity to allow me to play chauffeur. I did not mind, although I do admit that Dupont Circle got the best of me every single time I had to go around it. Between the GPS and the four lanes separated into two concentric circles by a traffic barrier, I did not ever make it to the right exit of the circle on the first try. Otherwise, city driving and parallel parking were no big deal. 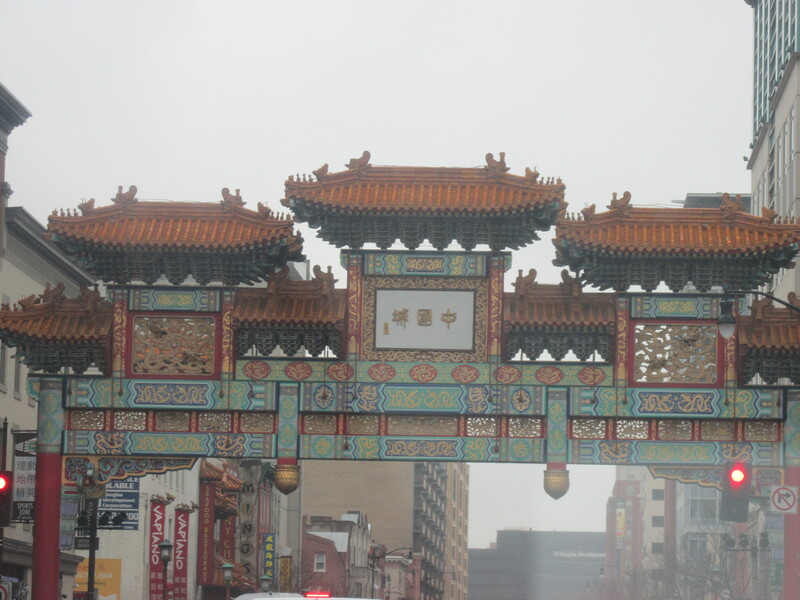 This country girl can do D.C. traffic…just don’t ask me to navigate a traffic circle! Friday turned out to be bitterly cold with snow and rain all day long. We had breakfast with Grandpa and his sweet friend and companion, Adrian. (When he moved, he reportedly insisted that she had to move, too, and that they had to live side-by-side. So they do. His apartment is next to her’s.) Adrian does not have many living relatives from what I can tell; she is a widow and her only child is deceased, having never married. Adrian LOVED having us around. 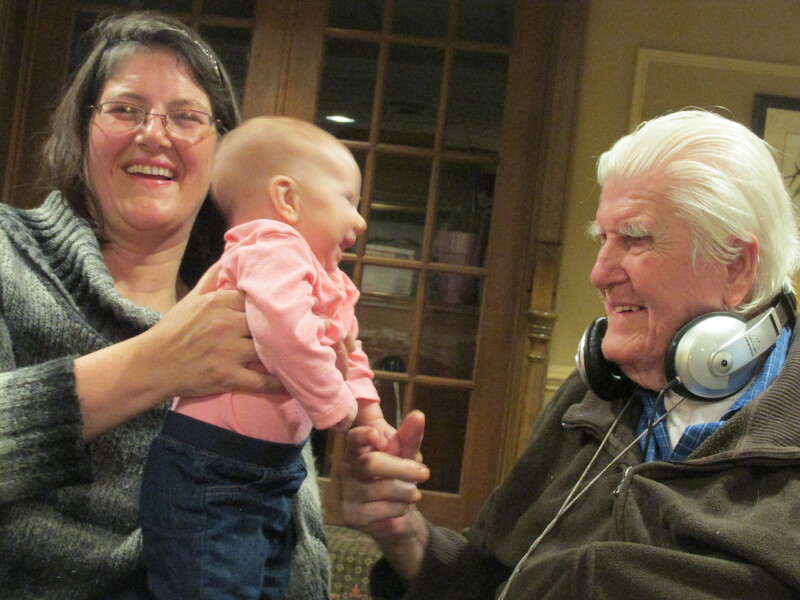 Grandpa is very deaf and cannot hear much of what is happening (hence the earphones which are attached to a microphone…which works somewhat IF he actually wears the earphones), but Adrian was completely engaged in our conversation. Grandpa’s night time caretaker stayed around long enough to snap our first five generation photo. After breakfast, we went upstairs to tour the two apartments. Both are very nice with new carpeting and clean walls. Grandpa has some family pictures as well as some art that at one time hung in the family home. 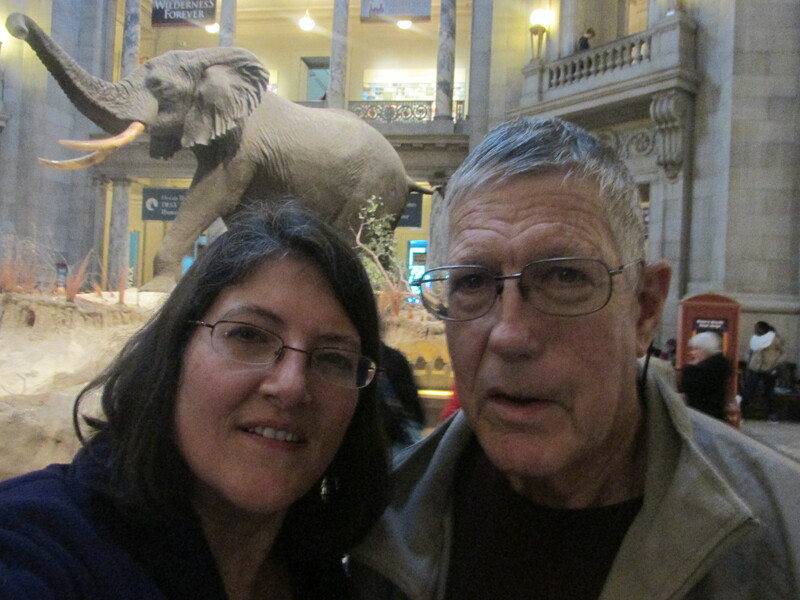 It was obvious that Grandpa was getting a little tired, and we had decided ahead of time that we would spend the middle of our days exploring D.C. and surrounding areas, so we headed off for our first day of adventures. Dee wanted desperately to get into the National Gallery of Art, but it was Friday and the traffic around the Mall was intense. Several blocks and parking areas were cordoned off, and we could not get near the art museum, so we settled for the Museum of Natural History. We managed to get a close parking spot using Opa’s handicap parking sticker (thank GOD for those inconvenient graces!) and we trucked inside. 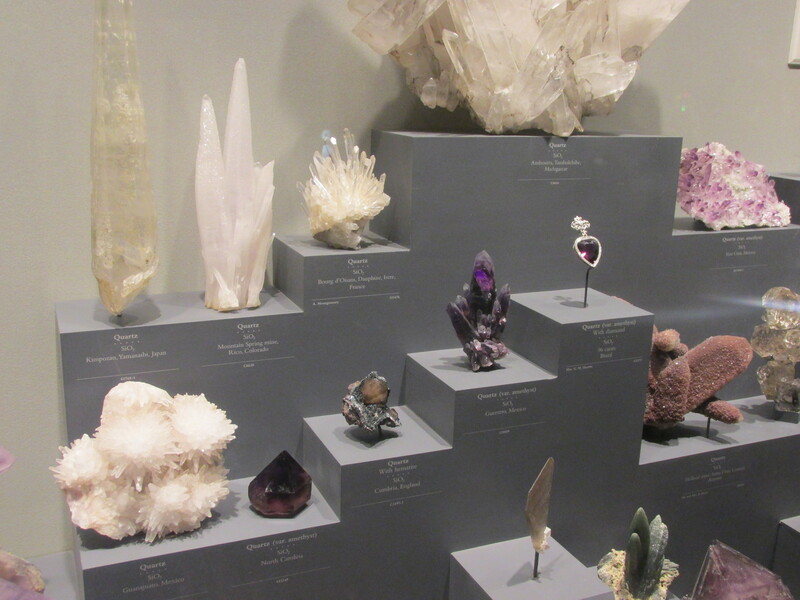 There were a gazillion a lot of school children in the museum, so we decided to head up a level to the mineral exhibit. I believe in a young earth. I believe that God specifically created the world and everything in it. 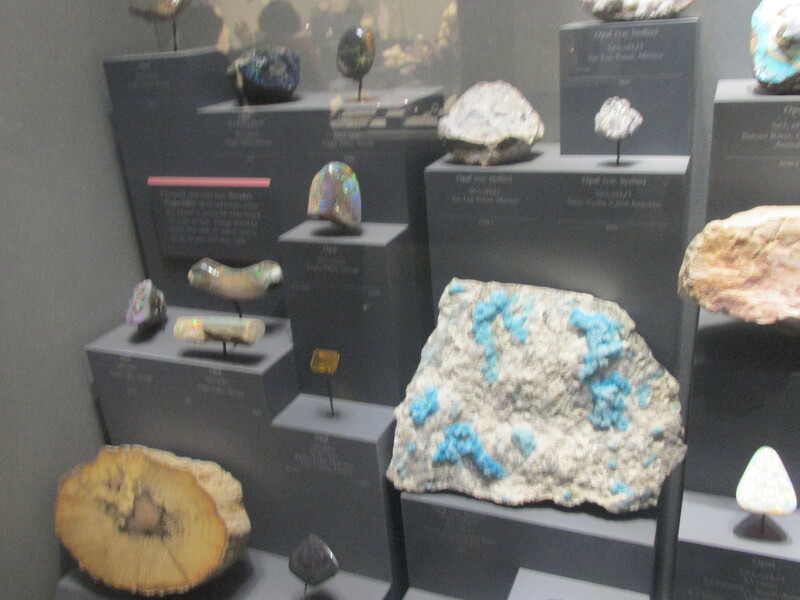 So when we saw the mineral exhibits, where opals of different colors, created with the same elements under different conditions, I was awestruck. The same happened with the quartz…all those amazing colors and shapes made with the same chemical structures but formed under different circumstances. I was struck by the thought that God had made these amazing rocks deep inside the earth, a world of brilliance and beauty that screams His name and glory, that only He could see or even know about until such a time appointed that we humans should find them, dig them out, polish them and (in some cases) learn to replicate them. I had a moment of worship there in the throng with hundreds of other people buzzing by with their school check lists and scavenger hunts, the young children running to and fro, and the elderly taking their time as they meandered casually from one display to the next. My moment of worship was interrupted by the need of my father to find a place to rest. Omie and Dee wanted to go see the mummy exhibit, and I took Opa back to the car. Sweetpea slept through her first tour of the Museum of Natural History strapped securely to Dee’s chest in the Moby wrap. We decided we were hungry, and the popular consensus was that Chinese food would hit the spot. My mother’s new car has the nifty feature of locating restaurants and other attractions (which is how we navigated to the museum), and it directed us to China Town, just .4 miles from the Museum of Natural History. It was snowing and raining again, and there was no parking to be found. 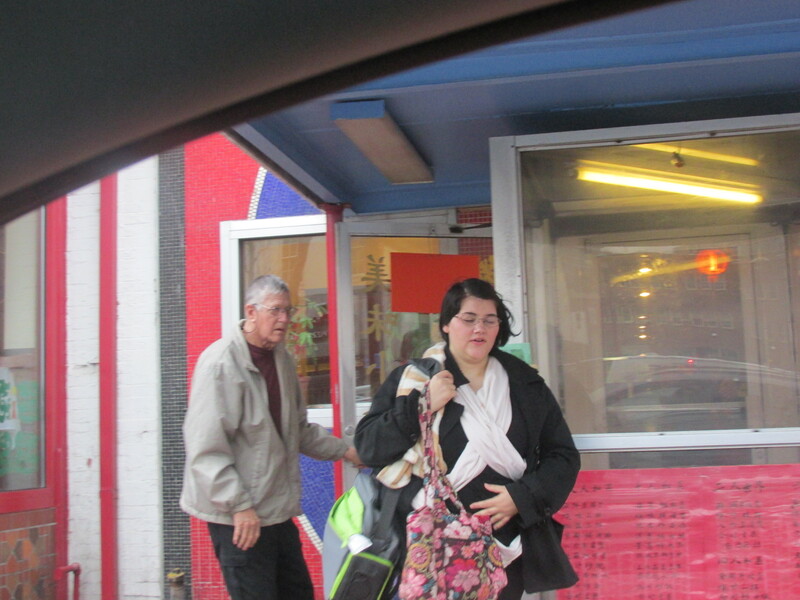 I ended up finding a spot around the next block, and since Sweetpea was in need of feeding, Omie and Opa headed off on foot to find the restaurant while I stayed with Dee while she fed Sweetpea. When we had parked and paid for the meter (my mother downloaded a parking meter app—how progressive is that?!) we noticed a few police motorcycle cops parked just behind our spot. Shortly after my parents had reached the corner, the motorcycles started, and several police cars blocked off our block. 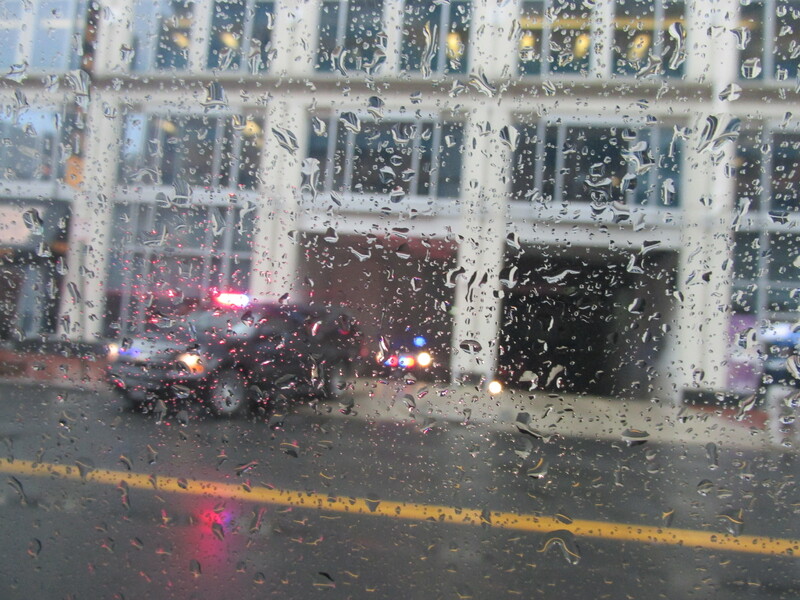 A secret service agent (it said so on his police vest) came and tapped on my window. He said we could not leave the car for a few minutes because they were “waiting on a departure.” They folded our outside mirrors into the car, and we waiting while Sweetpea finished her meal. Suddenly, the underground garage across the street started spewing vehicles–most with lights, one with flags–like ants escaping an ant mound that a little boy has just kicked over. I have no idea how many vehicles were in the entourage, but there were sirens and lights galore. In about ninety seconds, the commotion had ended. The cops all left both ends of the block, the street was opened back up, and we sat there in stunned disbelief. We have no idea who warranted so much security, but he or she must have been important! Meanwhile, Omie and Opa had found a nice (by nice, I mean affordable) Chinese restaurant, and we walked down and over a block to meet them. It was quite wet and cold, and hot soup was just the thing to make it feel better. We all enjoyed our meal, although Sweetpea made her disgust with her interrupted after nap known to all the diners. I am not sure they all enjoyed their meals, but there was no where to go except back into the rain, and that was NOT happening. I had gone to get the car, and my mother had walked out front to see if I was approaching, when my father got slightly disoriented. He walked down the back steps of the restaurant trying to find the exit, but Dee was on hand to reign him back in, and I picked them all up in front. We made our way back to Grandpa’s facility for the 4:00 refresher which comes complete with watered down wine–red or white, drinker’s choice–or soda. 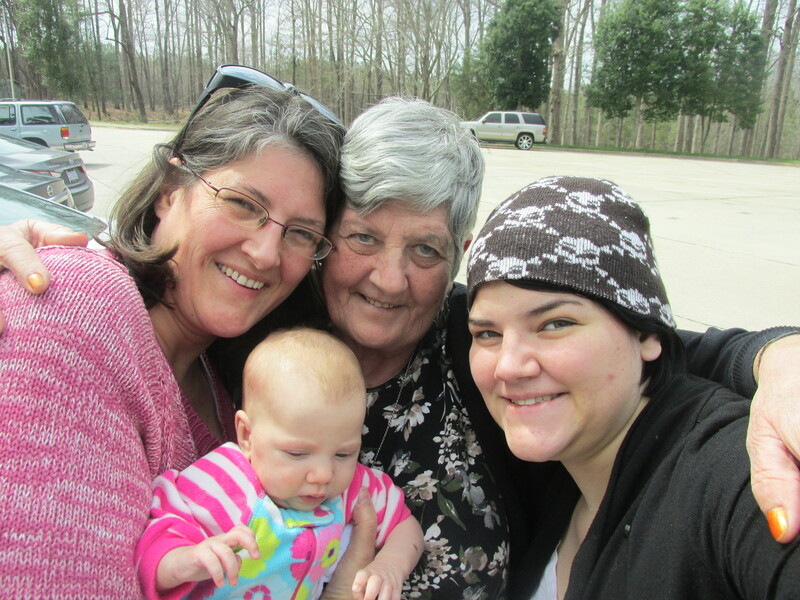 We visited with Grandpa a bit and fielded the same three questions from every elderly woman in the place: “How precious! How old is the baby?” “What is her name?” “Who are you related to here?” Sometimes we answered the same questions to the same people three or four times over the course of the hour! 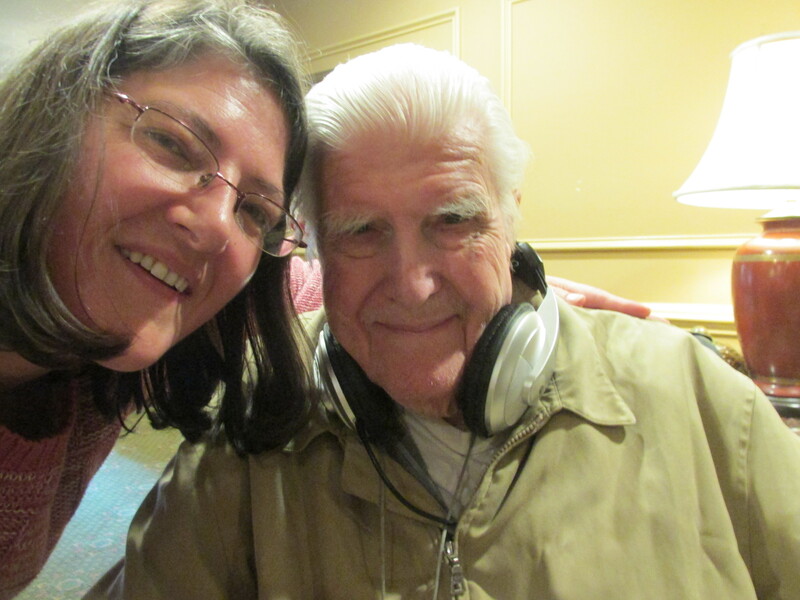 (Obviously the reason some of them were in assisted living!) Grandpa had a great time watching Sweetpea play on the floor on her blanket. I convinced him to let me help him hold her for a few moments. 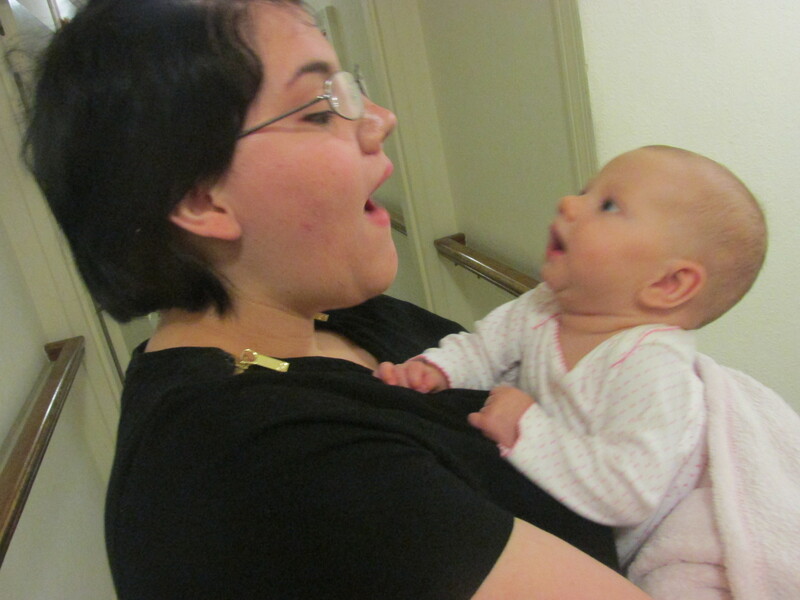 She baptized him with baby spit up–I apologized and cleaned him up, and he said that he thought his chair would be okay. I asked Grandpa to tell me some of my favorite stories from my childhood, like the one about his father flipping a pancake while cooking over a campfire when he was a cowboy, and instead of landing it in the pan, it landed in his boot! (Ouch!) I asked him to tell me my favorite joke, too. Grandpa obliged. I cannot do this joke justice, but it always makes be laugh! 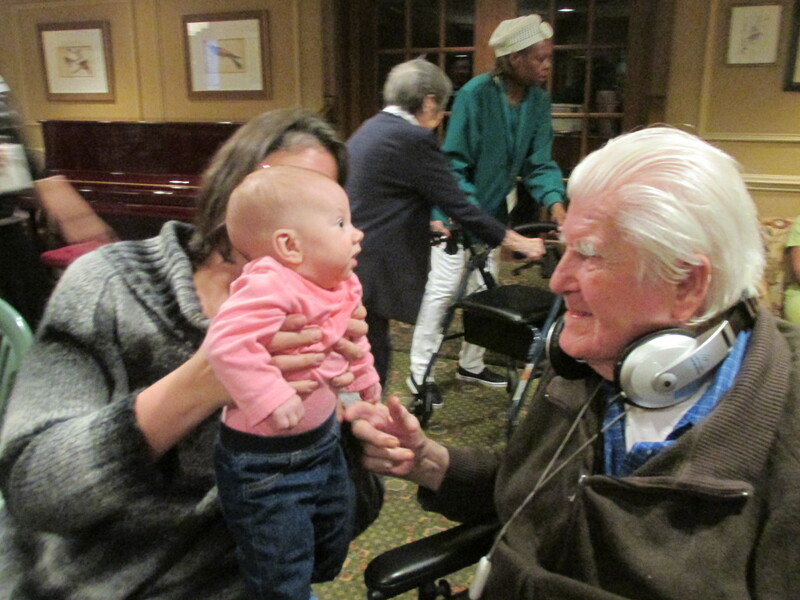 Great-great Grandpa and Sweetpea…grins all around! 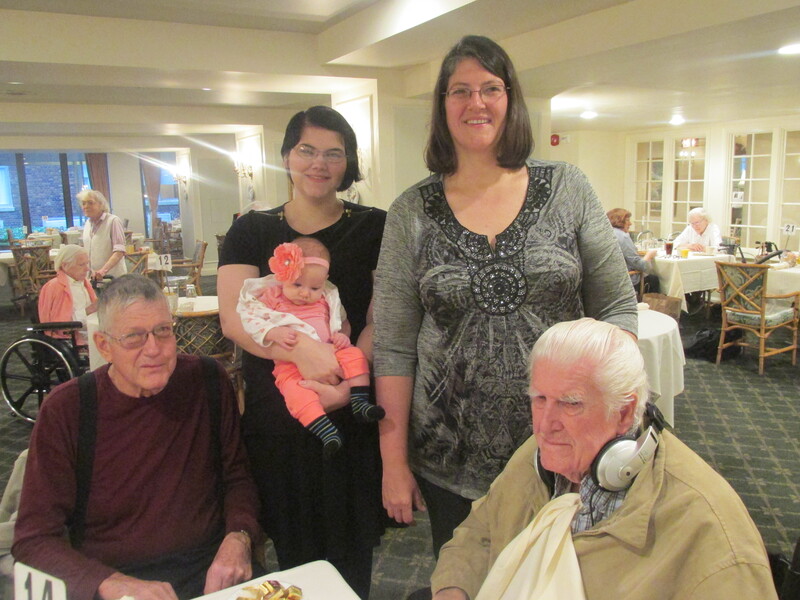 We had dinner with Grandpa, which was quite an affair because we disrupted the assigned seating of the dining room. Normally, Grandpa and Adrian have a table for two. We took over the table next to them, and that left a few disgruntled residents. Oops. After dinner, Grandpa could not be dissuaded from going to the activity room to watch Chocolat (which I suspect he spent more time napping through than actually watching.) 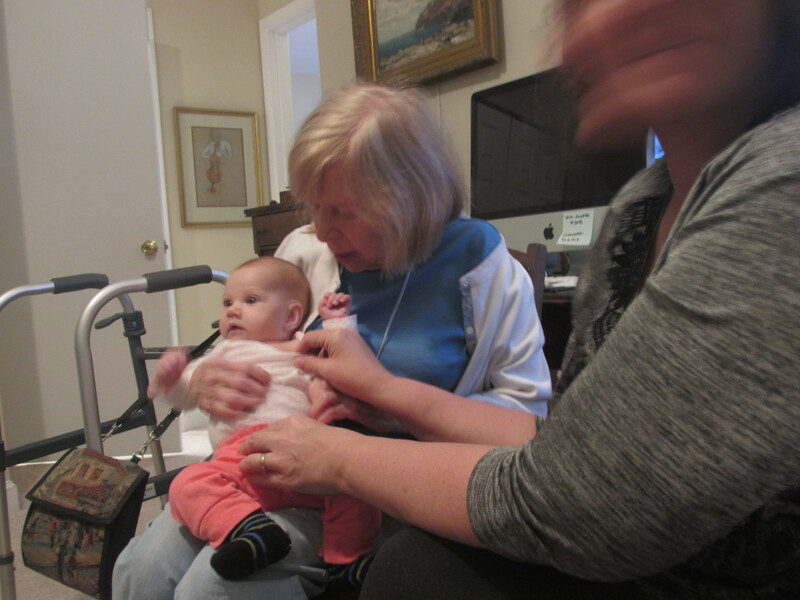 Adrian, however, was quite agitated about this turn of events, so we all went upstairs to spend a little time with her in Grandpa’s living room. We looked at his photo albums, which I believe my incredibly talented sister, Jenny, put together for him–one of Maine and the family vacation homes there (one of them a one-room cabin on a peninsula that has running water and electricity, and one of them an 800 sq. ft house on a small island with eight other houses with NO electricity or running water–basically camping inside.) The other album was made just after our first (and so far only) cousin’s reunion about five years ago, with a profile picture and short bio for each of the grandchildren. It was sweet to see these albums prominently displayed on Grandpa’s coffee table…whether his choice or my Uncle Peter’s, I am not sure, but either way, it was sweet. My mother said that when she went to get Adrian’ s walker out of Grandpa’s bedroom (where it had been placed to be out of the way) there was on the window sill a picture of me at about age two playing with my cousin Amrit, then about age one. That touched me for some reason. Day two ended with us going back to the other facility where our rooms were, and we all went to our respective beds. Saturday dawned a bit warmer and sunny. Horray! We left the facility a bit late, but we figured the traffic would be a bit better. Dupont Circle was waiting there to flummox me once again, but once I hit Connecticut Avenue, I was gold. I knew exactly how to get to our place and where to find parking. We waited a bit for Grandpa and Adrian to come down for breakfast, and then we all ate together. 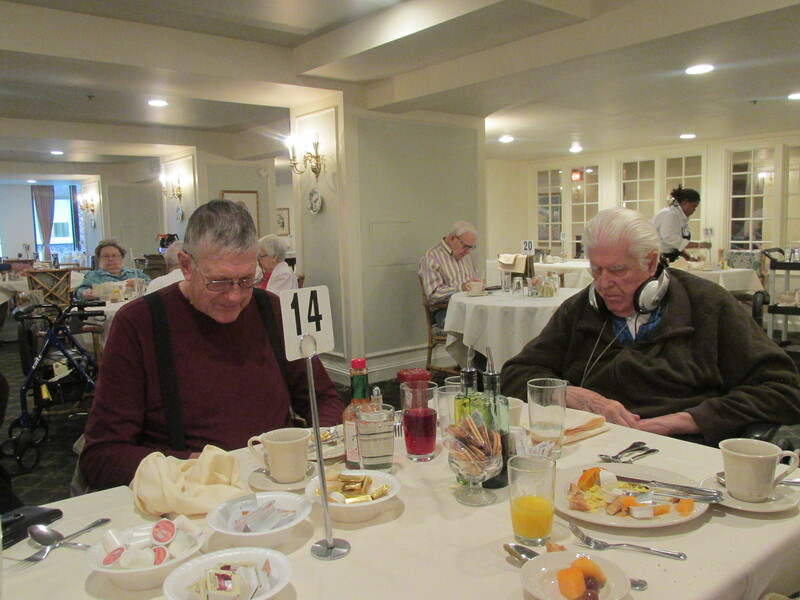 We did not hang around too long after breakfast as we had a list of things we wanted to do. Breakfast table naps..father and son napping in tandem. Actually, Daddy woke just as I reached for my camera. When I told him he ruined my shot, he shot me a grin, and then he “faked” being asleep so I could take this. He might not always have his words and may sometimes get disoriented, but he still has his sense of humor! 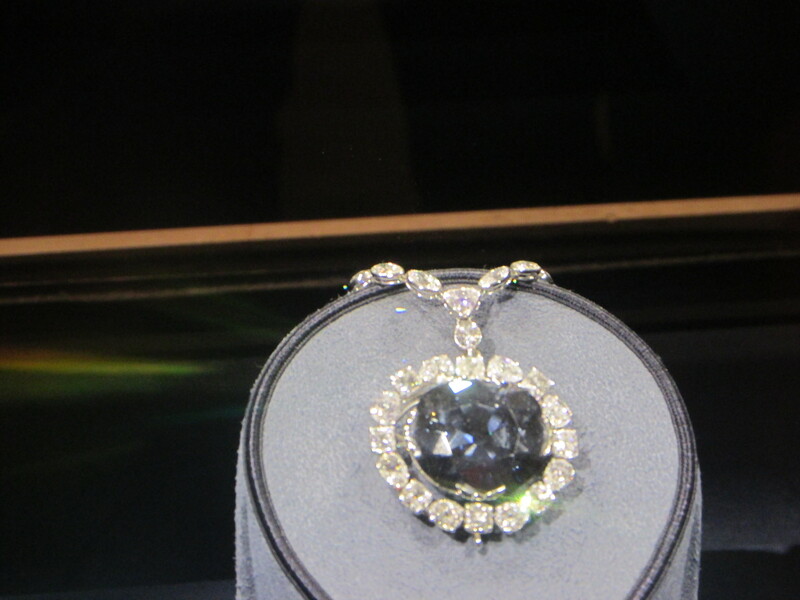 First on our list was the National Gallery of Art. This time I was able to get us close, right on the Mall. We parked and took the stroller in. It was amazing to see the works of painters I have actually now studied with my children: Vermeer, Pieter Bruegel the elder, Monet, Manet, Degas. 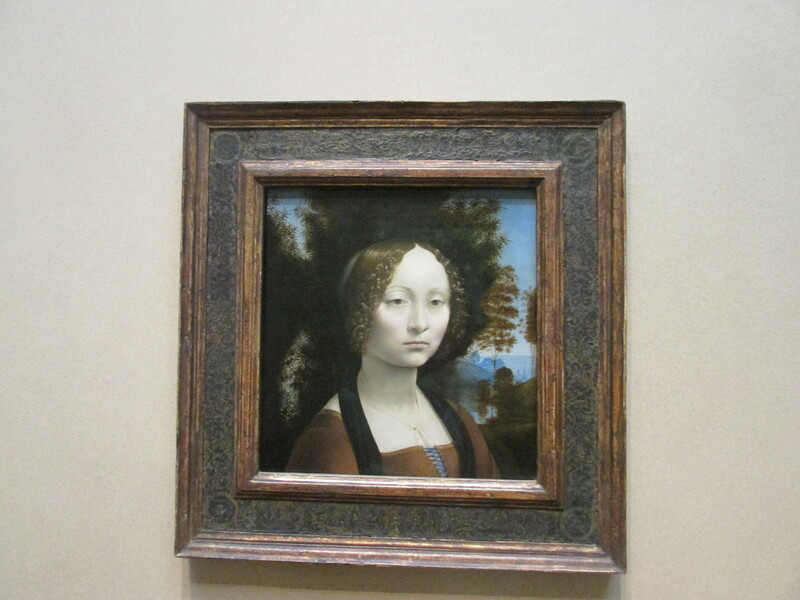 and the only work by Leonarda Da Vinci in North America. I discovered Jan Steen, and my mother related that his works are all so busy–the one we looked at that day had many people in a kitchen, egg shells on the floor, boys climbing the counter, in short, what MY house would have looked like in the 1600’s–that there is saying in Dutch that translates to “like Jan Steen’s house”. We focused mostly on the Dutch painters, but we also meandered through the Renaissance and Impressionist painters. It was glorious! And exhausting! 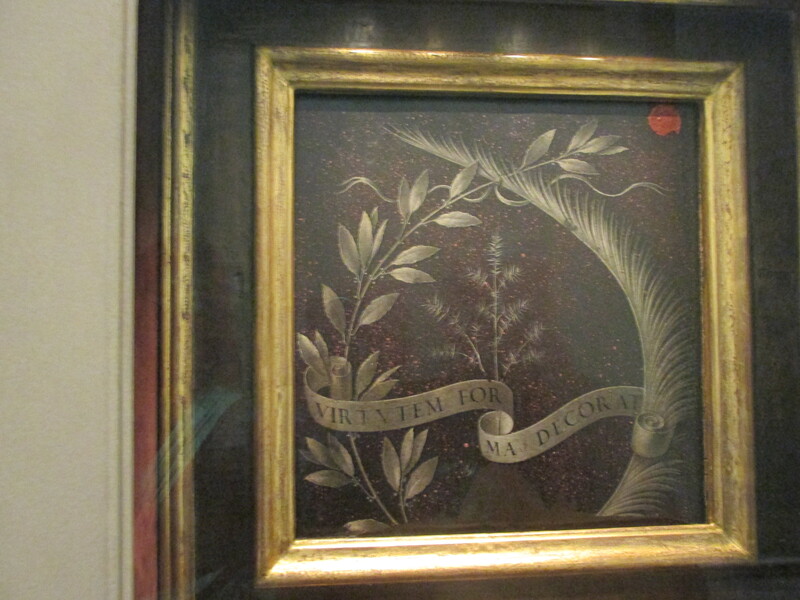 The back side….this was on the reverse of the the Ginevra de’ Benci portrait. The whole frame was set in a specially built wall–the front was framed as you would normally frame and hang a picture. The back side was under the plexi-glass forming the back side of the wall. It was amazing! Then we headed to Chevy Chase to see the home where my father grew up. I was able to navigate the Chevy Chase traffic circle without incident; horray for well-marked exits! We drove past the house twice, and then we explored the neighborhood. It is gorgeous….my father’s childhood home is larger and has slightly more yard than the others around it, and it was built in the early 1900’s. Many of the other homes are newer. All of them have narrow driveways and almost no place to park, so parking is on the street…which makes navigation interesting. We found the elementary school where my father attended, then we went in search of the National Cathedral, where two of my uncles were choir boys. It was under renovation after an earthquake had damaged some its towers. We returned via an alternate route, which quite upset my father who was absolutely determined that we needed to be on Connecticut Avenue. It was nearing four o’clock, so we once again found parking at Grandpa’s facility. We repeated the endless same questions from all the sweet old ladies about Sweetpea and who we were. I had called my cousin Amrit the evening before, and we had arranged for her to join us for dinner that night. She arrived during Refresher, and it was hugs all around. It was really nice to see Amrit. 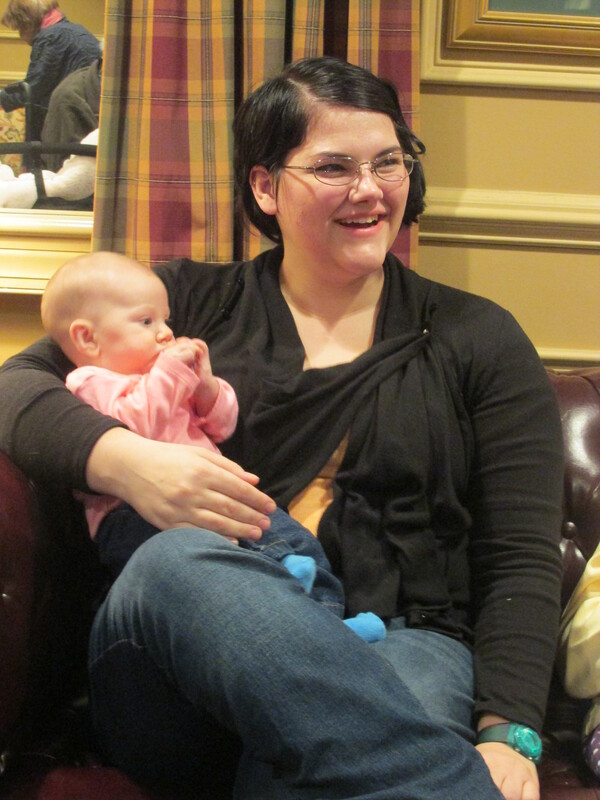 She says she lives about 45 minute from Grandpa, but she rarely sees any of the cousins when they come through. I will have to rectify that on my end, anyway. We remembered that another cousin just moved to D.C. with his wife, but he did not answer and I left a message. I did get a text from him this morning; he had been out of town over the weekend and had just returned. I am hopeful that we will get to see more of the cousins when we visit Grandpa. After dinner, Grandpa again was determined to watch his movie, another one starring one of the same actresses, I noticed, and we again retired upstairs to have some time with Amrit and Adrian. Amrit and I discussed which of the cousins we see on Facebook, to which Adrian replied, “That book must have a LOT of pages by now!” She is so funny! Everyone was tired, especially Opa, and after we had exhausted his patience with us, we opted to go ahead and leave. Amrit and I walked out together–we had parked one street away from each other, so I walked with her and she drove me to my mother’s car. 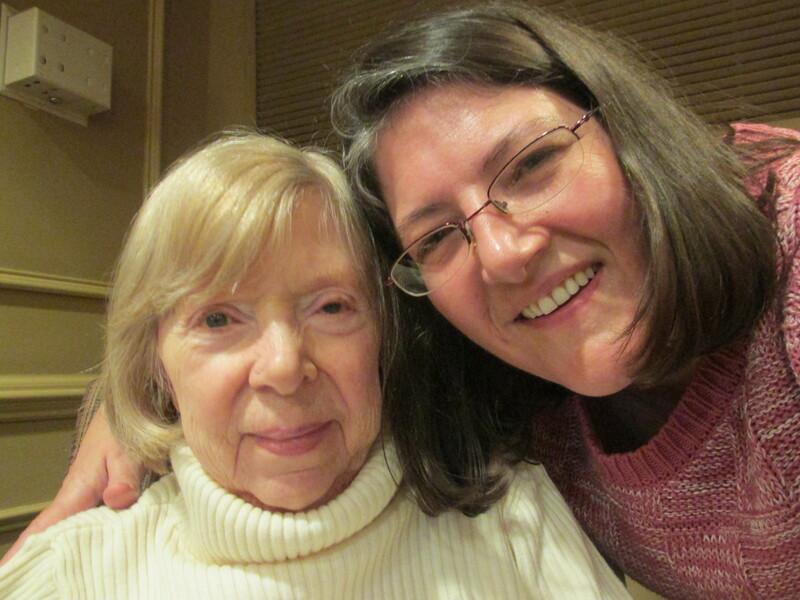 We visited as long as we could, which was not nearly long enough, and then my mother called to find out where I was. Amrit and I hugged goodbye, and I drove around the block to pick up all our party. We headed back to our nighttime accommodations, and we all retired for the night anticipating that we would have to load up and head home after breakfast the next morning with Grandpa. We got a late start the next morning, but we did eventually get all our bags and belongings back into the car. We headed back to Grandpa’s place, and once again had to wait for him and Adrian. Grandpa eats virtually the same thing at every meal, at least the meals we witnessed: a small bowl of cantaloupe with three red grapes, two scoops of cream cheese, half a piece of rye toast, which he spreads with cream cheese and orange marmalade, and ONE teaspoon of scrambled eggs. At dinner he follows this with strawberry ice cream. He has quite a ritual in eating this meal, but I suppose at 97 years old, he is entitled to eat what he wants and how he wants. A few months ago we despaired that he would ever be in shape to do that again….he was very sick and not expected to live at Christmas. The fact that he was able to make an historic picture for our family is miraculous. Amrit took this family photo, but somehow we neglected to get one with her in it, too. Next time! Our drive home was mostly uneventful. 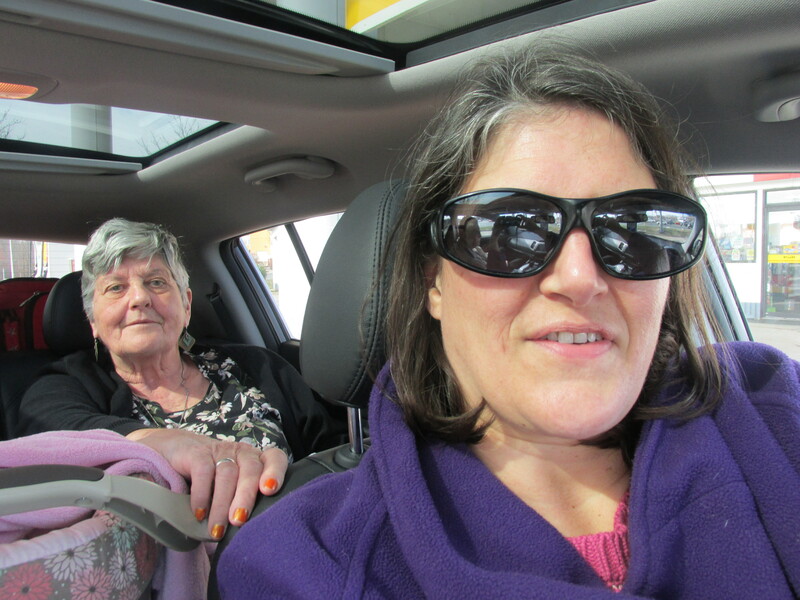 I drove most of the way, with my mother taking one shift when the sunlight was wreaking havoc on my photo phobic eyes (and yes, I had on sunglasses!) Dee and I decided on the spur of the moment to visit Star Child since we were just 20 minutes from her. It was a quick visit at the end of a long day, and then we headed home. Our packed weekend was a success! 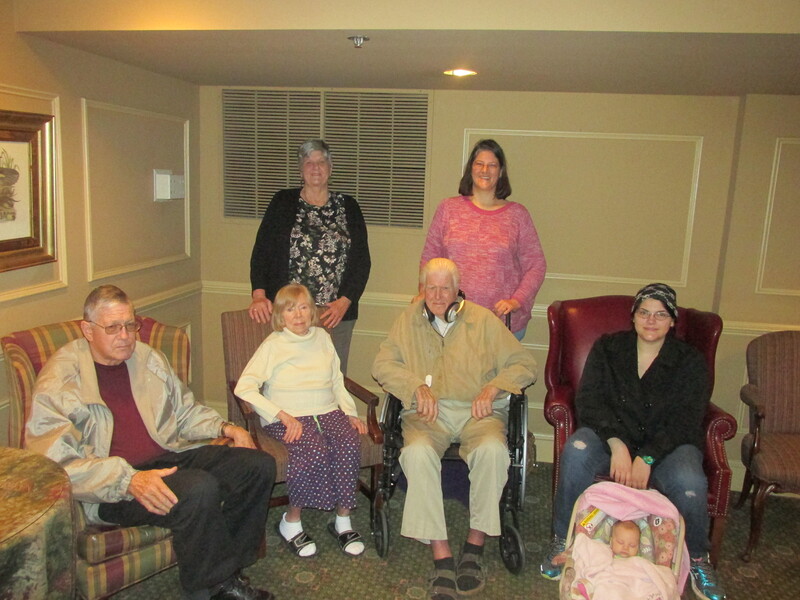 We have several five generation pictures, and I was able to visit with my Grandpa again as well as spend time with my parents and Dee. As much as I enjoyed my visit, I am glad to be home. There really is no place like home!